Don’t know Daniel Tiger? If you have a toddler in the house, here’s why you need him. All of the above is, of course, totally normal toddler/preschooler behaviour. Two-year-olds and three-year-olds have a lot of emotions to deal with. But that doesn’t make things any easier when you’re rushing to get out the door in the morning, or you’ve had a long day at work and don’t have the patience to properly manage a tantrum. Let me introduce you to a 4-year-old cartoon tiger named Daniel Tiger. He will change your life. Generations of children in the U.S. grew up watching Mister Rogers (he often came on right after Sesame Street); he was like an additional grandfather who was there to listen and play with in a totally supportive and non-judgemental way. Mister Rogers has been in the news a lot lately; for one, 2018 marks the 50th anniversary of when his landmark show debuted. Secondly, it was recently announced that Tom Hanks (naturally, one of America’s most beloved actors) will be playing Mister Rogers in a forthcoming biopic. And finally, given the recent, uh, political climate, there’s been much discussion about how we could all use a refresher in the lessons Mister Rogers taught us about kindness and respect. Daniel Tiger, which began in 2012 and is geared toward 2-to-4-year-olds, carries on Mister Rogers’s legacy beautifully with its social-emotional curriculum. It’s one of the few shows that’s actually recommended by the American Pediatric Association (the people who generally warn against screen time), precisely because of the important lessons it teaches and the potential for parents to watch along and help reinforce those lessons (more on this in a sec). The basic premise: Daniel is a 4-year-old tiger who lives with his parents in The Land of Make Believe (on the original Mister Rogers, a segment of the show was dedicated to this wonderful land, which he created using various puppets). Daniel’s father, along with a number of his friends’ parents, was a puppet on Mister Rogers. Daniel’s friends are a mix of animals (a cat, an owl) and kids (including one little girl, Chrissie, who uses crutches and leg braces, and helps teach Daniel about differences). I swear, the brilliant team behind Daniel Tiger has seriously thought of every issue – big or small – that crops up with preschoolers. My daughter is very strong-willed and opinionated about what she wears every day. On various occasions she has proposed wearing her bathing suit, her bathrobe, and a heavy wool sweater her grandmother knit her to school. Then she saw the Daniel Tiger episode “Tutu All the Time”, in which one of the characters insists on wearing her favourite tutu to class, and subsequently spills paint on it. Backed up by the catchy jingle “Think about what you’re gonna do, then pick the clothes that are right for you!“, the episode is all about choosing appropriate attire for the task at hand. Now, when Maggie wants to wear her rain boots to ballet, or a long dress for playing on the playground, we need only sing the jingle to calmly remind her about what clothes are suitable for that circumstance, and she gets it. It’s amazing, I tell you! 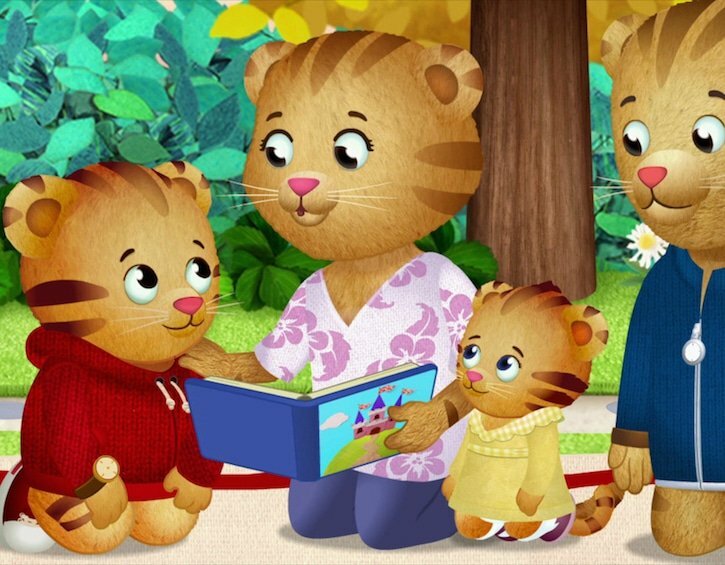 By far our favourite series of Daniel Tiger episodes, however, are at the start of season 2. First, Daniel learns that his mother is pregnant. In the next episode Daniel meets the new baby (the adorable Baby Margaret), and in the third and fourth Daniel has to adjust to living at home with a baby (whether it means getting less attention from his parents, or suddenly having to share his toys). We showed Maggie these episodes for months before her baby brother was born (Daniel Tiger is an amazing babysitter when you’re pregnant and exhausted! ); they absolutely helped her prepare for what to expect, and got her excited for things like visiting her new baby brother in the hospital. In fact, the first time she held her new baby brother, she sang the same sweet song to him that Daniel Tiger sang to his baby sister. Honestly, if you’re dealing with a certain issue with your child, I highly recommend finding the applicable Daniel Tiger episode. We did this with potty training. The Potty Song will haunt your dreams, but your toddler will also be asking to listen to it on repeat (“If you have to go potty, STOP! And go right away! Flush and wash and be on your way!”). PBS also makes a great companion app for potty training. There are two Daniel Tiger albums available on Spotify; “Use Your Words” and “It’s Almost Time to Stop” are among our favourite songs to listen to. When Maggie’s playing on the playground, I need only sing “It’s almost time to stop, so choose one more thing to do!” and somehow, as if magically, she gets it and is ok with leaving after a few minutes. Obviously Daniel Tiger doesn’t stop her from throwing tantrums, or struggling to share with her friends, or sometimes crying when I drop her off at school, but he does make things more relatable for Maggie and gives me a great point of reference. This of course means you at least sort of-kind of need to pay attention when watching the episodes but trust me, it’s so worth it! Honestly, my only critique of the show is that Daniel’s parents never seem to get angry or upset. Frustrated, yes, but they are extremely even-keeled. So long as Maggie doesn’t turn it around to say, “How come Daniel Tiger’s parents never get angry and yell?“, I’m cool with it. To be honest, they actually model proper behaviour for me, which I appreciate since it’s not like I have a clue what I’m doing most of the time! Best of all, season 2 (25 episodes!) of Daniel Tiger episodes are available to stream on Netflix in Hong Kong (there are even more episodes available on Amazon Prime, and all are available for purchase on iTunes). Give it a watch next time your toddler is struggling with his or her emotions. You can thank me later. This article was originally published on www.sassymamasg.com.